The words are on the next HoC episode, which is coming along great, if far, far too long. I generally shoot for eight scenes, but this one requires a ninth. On top of that, every scene is running over 700 words. I’m going to have to cut a lot to get it down to size and it will still definitely be the longest episode yet. The story is getting down to the end. There are four episodes remaining and I am being very careful to build up my head of steam for the conclusion. The tension is great and the words are just flying. I’m fluctuating between being delighted and heartbroken to reach the end. On the one hand, I’m very ready to move on to other projects. The majority of my creative energies are directed into HoC at the moment, but there are a lot of plans I have simmering that I look forward to. But I’ve also come to love this world and the characters living in it; part of me is contriving side stories and sequels that will let me revisit it. As of #16, HoC is over eighty thousand words long and, when completed, should run at least one hundred thousand words. It is the longest thing I’ve ever written. To me, it is amazing for that alone. When I started this blog in September, 2009, I got the idea that I wanted to do a serial, something about several couples dealing with everyday life as much as the bigger, more adventurous parts, preferably with lots of cooking. To say that HoC has ended up being more than I ever imagined — more work, more fun, more important to me — is the understatement of the century. In totally unrelated news, I have officially hopped genres and sent out my first science fiction story. The anthology is MutatioN Press‘s Music for Another World. Lumping science fiction and fantasy in with a miscellany of other possibilities under the term “strange fiction,” the anthology is about all the ways that humans (and maybe non-humans, too) interact with music. I have, as of the moment, received a favorable note from the editor, so I’m hoping my submission is in contention for the final cut. I hope to know for sure around the end of the month. The story is “Turing Guessed Wrong” and it was a disgusting amount of fun to write. Having heard about Emily Howell, I knew I would have to write something inspired by the idea at some point in the near future. The story is all the things I love: it’s a family drama; it’s centered on daily life; it’s got belligerent teenagers and harried mothers. Actually, it’s a lot like HoC in those respects. If you like science fiction, especially the future of AI, biotechnology, and pop culture, and HoC suited you, “Turing Guessed Wrong” should be right up your alley. I’m delighted that it may appear in this anthology. It’s been a little while since I posted. In the mean time, I saw Alice in Wonderland (charming, but somewhat unsatisfying) and The Imaginarium of Doctor Parnassus (weirdly wonderful), enthused over the Oscars, and had my soul crushed. Oh, I’m sorry, what? That last bit? Yes, well, it happens. Story: I went to Comic-Con last year with a friend who is a pro artist. I want to go again. I had pipe dreams of applying for a pro pass myself, since the qualifications seem to suggest (though only by turns) that people who have written for books count as pros. Mostly, I thought I would just try and see what happened. Instead, when I started to fill out the online application, I discovered that I don’t even have enough pro publications to qualify, assuming they do accept books. Um. To say I was disappointed was something of an understatement. It felt like someone had come into my house, poked around my belongings with a vaguely offended air, and announced that I don’t actually count as a person. I realize that my status as a pro is tentative by even the most generous standards, but this felt so personal. Much more so than a rejection letter, which I deal with very well. I went onto Duotrope’s Digest and found a bunch of anthologies accepting submissions over the next year. There were not a lot of romance ones available and I had checked out most of them previously and determined that I was not interested. But there was fantasy in droves. And there was science fiction, which, okay, I haven’t written before, but that just means I need to learn. Same goes for horror, for which there were more anthologies than you can shake a stick at, even after I weeded out the zombie ones (one thing in horror that scares me too much). A couple romance crossovers and a few that accept just about any genre on the theme. And westerns. Two of them. I swore up and down that I would never write a western (I have personal issues with cowboys), except now it seems I will be writing some. It might sound like I trivialized all these genres that I don’t normally write, saying, hey, any idiot can write this. Thing is, I just want to tell stories. And I don’t like the idea that there are all these genres out there where stories can be told but I don’t have the knowledge. Because someday I’m going to have an idea that needs to be a horror story or a mystery or (jeez) a western but I won’t know it because I don’t know the genre. So okay, I’ll learn them. I’m actually pretty intimidated by these genres that are so unfamiliar. So I have my work cut out for me. But the point is I will write like the devil and if I get into even a few of the 27 (jeez again!) anthologies I picked out, I will be doing, well, rather a lot better than I am right now. Most of the calls are just for a few thousand words anyway, which, hey, now I’ll trivialize something because I can eat a five thousand word story for breakfast. So next year, when Comic-Con rolls around, I will have more than enough publishing credits (still assuming they accept books, but I know they do sci-fi and I’ve got 14 anthologies that will take it). Not everything pays, so not everything counts as pro work either, I suppose. But I don’t have time for these petty details. I will be a writing fiend. Plus, there’s the whole part where this is my job, but really, right now, I’m much more motivated by the idea of spitting in the eye of my (largely imaginary) detractors. 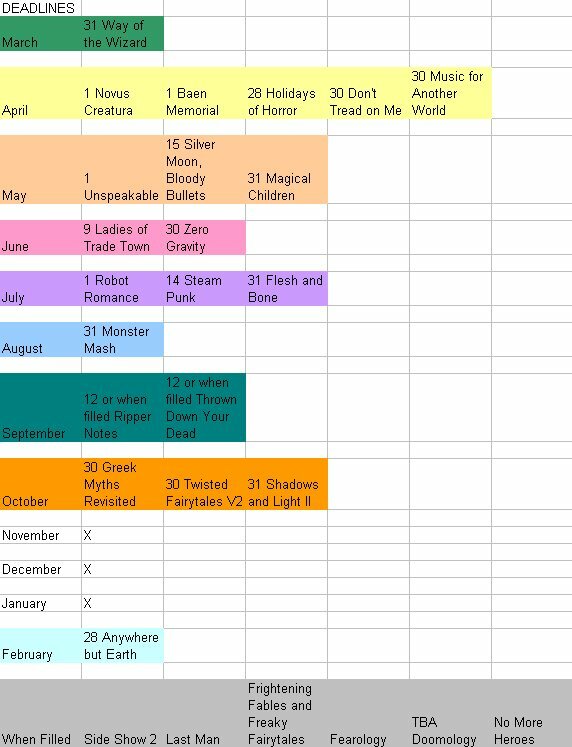 Here: a screen cap of the deadlines by month, plus a grab-bag of ones that will close when they fill (?). Yesterday and today, I worked on planning what I will be doing for the next few months. I know that I have a few deadlines that will all hit at the same time, including one that I anticipate problems with, so I needed to work out a game plan. I have the usual HoC episodes to get out, but after March 14th, I will have run out of material written this past November for NaNoWriMo. So I need to get back to writing new sections, as I’ve been coasting up to this point. There’s another SSBB issue scheduled for April and it’s historical. Historical has always been a genre I would love to get into, except the prospect of all that research and needing to get it right has scared me off. So I need to give myself as much time as possible. Also in April is Script Frenzy, an event put on by the same lunatics who brought us NaNoWriMo. I’ve done Script Frenzy three times and each time has been such a stunning flop that I now think of the event with no small amount of shame, fear, and desperation. Uh, yeah. So I’m thinking maybe script-writing isn’t for me. But I know there are always some people who use the time to do an unofficial NaNo again and I was thinking of doing the same. I’m not sure what I want to do exactly. I was thinking a novella, but I could be tempted into doing something longer and just using April as a jumping-off point. And following naturally from the plan to write something new and long was my search for more publishers. Prompted by a conversation with my mother, I went hunting to see what I could turn up. I went looking specifically for lgbt (q, i, a, p and so on — the list seems to get longer every time I see it) romance publishers. I got a few lucky hits and found some interesting possibilities. I’ve heard some rave reviews of Samhain Publishing, which is taking submissions for a broad range of romance combo plates. And I stumbled on Carina Press, which I gather is a new, all e-book imprint of Harlequin. They both want genres I’m interested in and their submission guidelines were certainly enticing. Unlike (and I will name no names, of course) some of the other publishers I turned up today. My reaction to a few was to ask, will you be handing out the paint-by-numbers kits or are we permitted to purchase them ourselves? My reactions to others bordered on rabid weasel. Mm, yeah. Fun stuff. But these two sound great and now I’m hungry to write something that could go out to them. I’m slowly making my way through episode 2. Unfortunately, I need to be sprinting through it. Still, starting tomorrow I’ll get to start introducing droves of new characters and take everyone on a tour of the House. So I’m hoping that the words will come easily. I take this to mean I have not yet made anyone’s eyes bleed with my contribution. I take comfort in such knowledge. I’m a beginner and so a lack of eye-bleeds is something I accept gladly as high praise. If you can hear me cackling like mad from here, it’s because I received my copy of the print version of the Bite Me anthology in the mail today. It’s a book! And it’s got ME in it! And I can hold it in my own little paws! My story is on honest to god PAPER, magical book paper, with a shiny cover and everything! Okay, yes, I’ve already seen the e-book, so it’s not like there were any surprises. But, but… BOOK! I’m old-fashioned and so: BOOK!